Copyright: © 2018 Aprato A, et al. This is an open-access article distributed under the terms of the Creative Commons Attribution License, which permits unrestricted use, distribution, and reproduction in any medium, provided the original author and source are credited. Figure 1: Accidental in-out-in placement of iliosacral screw. Figure 2: Posterior tilt may be achieve flexing the legs. 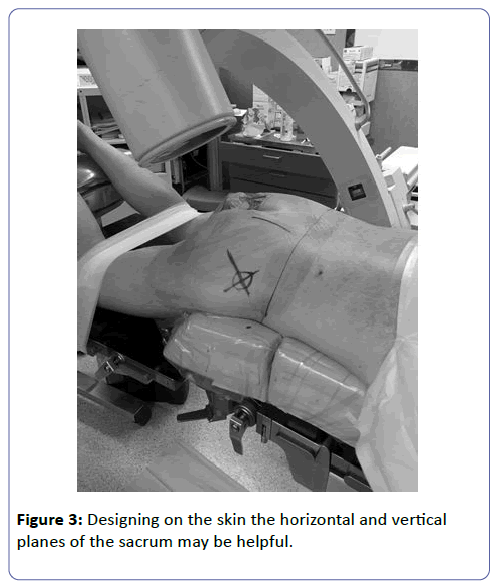 Figure 3: Designing on the skin the horizontal and vertical planes of the sacrum may be helpful. 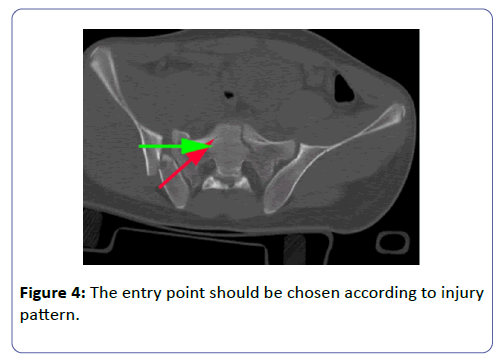 Figure 4: The entry point should be chosen according to injury pattern. 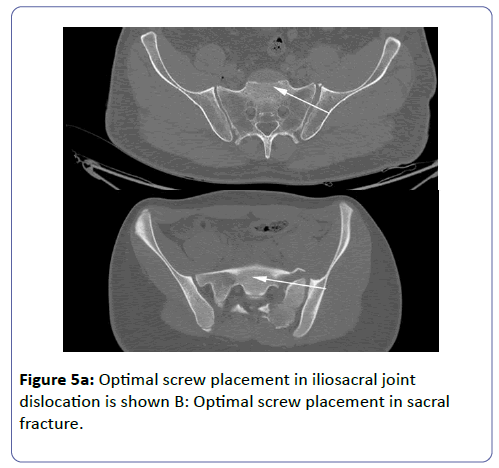 Figure 5a: Optimal screw placement in iliosacral joint dislocation is shown B: Optimal screw placement in sacral fracture. Figure 5b: Screws should achieve mid sacrum line in sacral fractures. 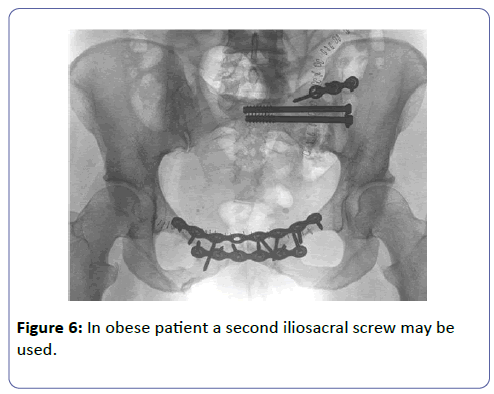 Figure 6: In obese patient a second iliosacral screw may be used. Andrich S, Haastert B, Neuhaus E, Neidert K, Arend W, et al. (2015) Epidemiology of Pelvic Fractures in Germany: Considerably High Incidence Rates among Older People. PLoS One 10: e0139078. Aprato A, Joeris A, Tosto F, Kalampoki V, Rometsch E, et al. (2016) Are work return and leaves of absence predictable after an unstable pelvic ring injury? J Orthop Traumatol 17: 169-173. Aprato A, Joeris A, Tosto F, Kalampoki V, Stucchi A, et al. (2016) Direct and indirect costs of surgically treated pelvic fractures. Arch Orthop Trauma Surg 136: 325-330. Halawi MJ. Pelvic ring injuries: Emergency assessment and management. J Clin Orthop Trauma 6: 252-258. Nicodemo A, Decaroli D, Pallavicini J, Sivieri R, Aprato A, et al. (2008) A treatment protocol for abdomino-pelvic injuries. J Orthop Traumatol 9: 89-95. Rommens PM, Hessmann MH (2002) Staged reconstruction of pelvic ring disruption: differences in morbidity, mortality, radiologic results, and functional outcomes between B1, B2/B3, and C-type lesions. J Orthop Trauma 16: 92-98. Zwingmann J, Konrad G, Mehlhorn AT, Südkamp NP, Oberst M (2010) Percutaneous iliosacral screw insertion: malpositioning and revision rate of screws with regards to application technique (navigated vs. Conventional). J Trauma 69: 1501-1506. Zwingmann J, Hauschild O, Bode G, Südkamp NP, Schmal H (2013) Malposition and revision rates of different imaging modalities for percutaneous iliosacral screw fixation following pelvic fractures: a systematic review and meta-analysis. Arch Orthop Trauma Surg 133: 1257-1265. Routt ML Jr, Kregor PJ, Simonian PT, Mayo KA (1995) Early results of percutaneous iliosacral screws placed with the patient in the supine position. J Orthop Trauma 9: 207-214. Miller AN, Routt ML Jr (2012) Variations in sacral morphology and implications for iliosacral screw fixation. J Am Acad Orthop Surg 20: 8-16. Orchowski JR, Polly DW Jr, Kuklo TR, Klemme WR, Schroeder TM (2006) Use of fluoroscopy to evaluate iliac screw position. Am J Orthop (Belle Mead NJ) 35: 144-146. Shui X, Ying X, Mao C, Feng Y, Chen L, et al. (2015) Percutaneous Screw Fixation of Crescent Fracture-Dislocation of the Sacroiliac Joint. Orthopedics 38: e976-e982. Calafi LA, Routt ML Jr (2013) Posterior iliac crescent fracture-dislocation: what morphological variations are amenable to iliosacral screw fixation? Injury 44: 194-198. Kraemer W, Hearn T, Tile M, Powell J (1994) The effect of thread length and location on extraction strengths of iliosacral lag screws. Injury 25: 5-9. Denis F, Davis S, Comfort T (1988) Sacral fractures: an important problem. Retrospective analysis of 236 cases. Clin Orthop Relat Res 227: 67-81. Khaled SA, Soliman O, Wahed MA (2015) Functional outcome of unstable pelvic ring injuries after iliosacral screw fixation: single versus two screw fixation. Eur J Trauma Emerg Surg 41: 387-392. Chen HW, Liu GD, Fei J, Yi XH, Pan J, et al. (2012) Treatment of unstable posterior pelvic ring fracture with percutaneous reconstruction plate and percutaneous sacroiliac screws: a comparative study. J Orthop Sci 17: 580-587. M Giachino, A Aprato, S Ali, A Bonanni, A Khattab, et al. (2014) Optimization of external fixation treatment in pelvic ring lesions by three-dimensional modelling and finite element analysis J Orthopaed Traumatol 15: S1-S17.